Does your pet need to be neutered? Does your pet need to be spayed? Your Antioch veterinarian can talk with you and help you decide what is best for you pet! Your Antioch veterinarian can spay and neuter dogs, cats, rabbits, ferrets, sugar gliders, and other small animals. Your Antioch Vet can also remove tumors, masses and other lumps and bumps from your pets. Many orthopedic surgeries are performed at your Antioch Vet, some complicated orthopedic surgeries can be referred to a local specialist. Cat declaws are performed surgically by your Antioch veterinarian. 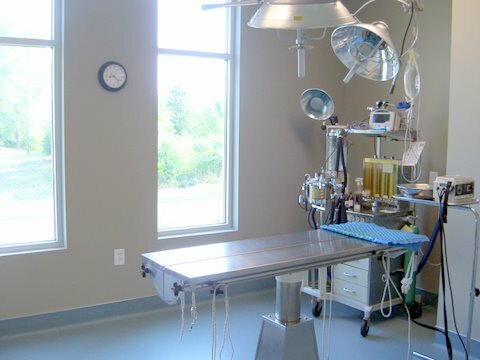 Adrenal surgery on ferrets can be done in our office as well as a thyroidectomy on your cat. There are many long term benefits to spaying or neutering your beloved pet. Female dogs and cats who are spayed before their first heat cycle have a low chance of developing breast cancer later in life. They are also not at risk for developing pyometra, which is an infection of the uterus which can be fatal! Neutered male dogs are less likely to develop prostatic problems. They are also less likely to fight and roam; therefore, they are less likely to need medical attention from fight wounds. Neutering also eliminates the risk of certain testosterone influenced tumors, such as perianal gland adenomas. Because neutered male cats are less likely to fight, they are less at risk for FeLV or FIV. Spayed animals also make better pets! Females who are not spayed generally go through 1-2 heat cycles a year. During their heat cycle, they will pass bloody vaginal fluid, so extra care must be taken to prevent carpet and furniture stains. Also, a female in heat will attract many male dogs to your house. Also, if your pet accidentally becomes pregnant, this can lead to additional cost for you and increase the chance that something could happen to your cherished pet. There is a huge pet overpopulation in this country. Every litter born contributes to this problem. In 2016, 1.5 million shelter animals were euthanized. This is down slightly from 2011, when 2.6 million shelter pets were humanely destroyed. These numbers do not include stray dogs and cats that starve to death, are hit by a car, attacked by dogs and wild animals, or suffer otherwise by being a stray. It is every pet owner’s responsibility to end this problem. You can do this part by spaying your pet. Please make your pet’s appointment today 615-361-4646 to help ensure the best health of your animal and to ensure that you do not accidentally contribute to the overpopulation of animals.